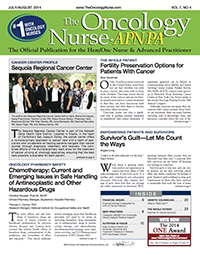 In this month’s issue of The Oncology Nurse-APN/PA (TON), we continue our coverage of the news from the recent Oncology Nursing Society (ONS) 39th Annual Congress and the 2014 Annual Meeting of the American Society of Clinical Oncology (ASCO). While there is growing attention paid to our experiences as cancer survivors, there is little acknowledgment of survivor’s guilt. It is neither well understood nor adequately discussed. Oncology nurses should be aware of the various options for fertility preservation prior to cancer treatment so that they can have discussions with their patients and refer them to fertility specialists when necessary. The toxic effects and safe handling of hazardous drugs are issues of major concern to healthcare professionals.